I am currently on the road so I'm going to keep this post QUICK. That's right, I'm on vacation, but had to stop by and show you a little of what I was up to before I left. I created this simple and elegant card for my mom's birthday. This card features a Happy Birthday greeting from the Party All Day set and one of Donna Downey's newer stamps, Whispy Blue Bell. 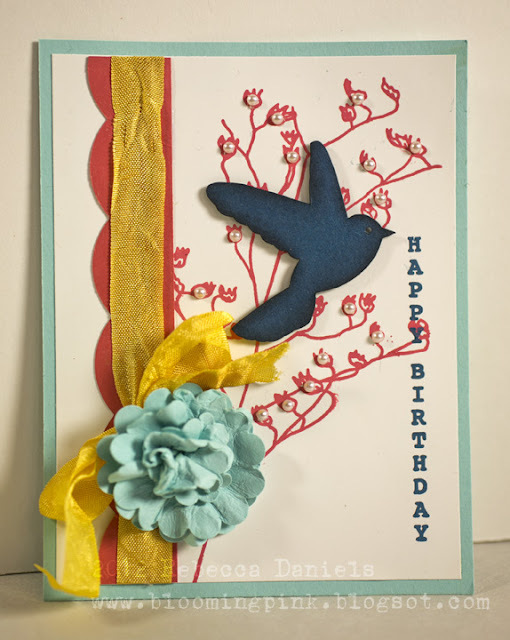 You will also notice I used the crinkle ribbon, Sunflower, from the Harvest Bundle. It is one of my FAVORITE yellows...not too bright, but not dull. Just right. And the nice color yellow will ease me right into the autumn season. So, from here until next Spring, no more light blue flowers and springtime sprigs! Well, that's it for me. I'm going on the prowl for Cougars on the Cougar Mountain Park trail in Seattle! Here, kitty kitty! Rebecca, I love the light blue and springtime sprigs. You have brought this color combo together beautifully. I love the bling on your sprigs and admit that this yellow is also one of my faves! Gorgeous Card and hope your vacation is enjoyable!